National Radon Defense (NRD) is your national network of radon mitigation specialists, serving across the continental United States and Canada. 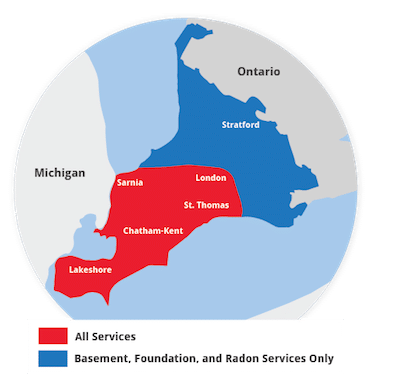 Advanced Basement Systems is the local National Radon Defense Dealer for the Ontario area, including Sarnia, London, Windsor, Chatham, and the surrounding areas. Contact us by phone or e-mail today! Health Canada recommends choosing a qualified radon mitigation contractor that is licensed, certified, or registered with the province to address your issue. NRD Members are required to meet all of these industry standards. Radon exposure is the #2 cause of lung cancer in Canada and the United States -- second only to smoking. To date, estimates show that 3,00 lung cancer deaths occur in Canada annually and 15,000-22,000 United States. Despite the danger that radon presents, many homeowners have not yet had their home .tested for radon. Checking radon levels is easy and affordable, and should be done in every home. If you live in the Southwestern Ontario area, Advanced Basement Systems is the expert you're looking for. We serve Windsor, Stratford, St Thomas, Leamington, Essex, Amherstburg, Strathroy and many nearby localities.